The Smell of Christmas from Aromatique was such a festive and pretty candle. When I put my nose up to the wax, spicy cinnamon wafted all around me – it was a classic cinnamon with the perfect touch of sweetness. But before I get into the fragrance itself, let me tell you a bit about the candle first. The Smell of Christmas is available in quite a few styles but the one I received was Aromatique’s holiday version. 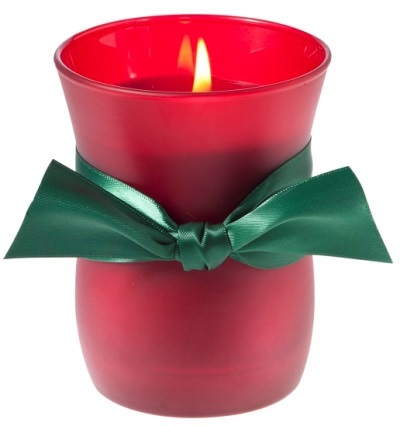 The vessel was a dark frosted red with matching red wax and a green thick bow tied around the center of the candle. It was simply stated but the Christmas red and green definitely made it more festive and a perfect candle to burn for the holidays. The delightful aromas of citrus and spice with naturally festive botanicals red berries, evergreen sprigs, nuts, pinecones and cinnamon sticks… creating a warm and joyful ambiance in the home. Interesting description with quite a bit going on. To my nose though, the stand out aroma in that description was cinnamon. 100%. I didn’t smell citrus, botanicals, evergreen, nuts or pinecones. I smelled sweet and spicy cinnamon all the way. I lit this candle in my large bedroom to start out and within a few hours I ended up moving it to a medium sized room where it performed much better. After a good 10 minutes, my entire guest bedroom smelled like a classic cinnamon, strong and spicy. And when I say classic, I mean the kind of cinnamon you smell during the holidays in every department or country store. Pure and natural cinnamon sticks. I don’t burn this scent often but boy when I do, I love it. Cinnamon is so warm and cozy and perfect for the holidays. Strength – on a scale of 1 to 10, I would rate this candle a 7 in a medium size room. 10 in a small room. It wasn’t as strong as I imagined it would be but it still gave a nice medium scent throw. This candle performed perfect. Zero wick issues, clean burning from beginning to end. If you love classic and spicy cinnamon scents, The Smell of Christmas from Aromatique is a candle I highly recommend should you run across one. Plus it’s such a pretty and festive candle, it’s perfect to burn during the holidays. The vessel glowed beautifully once lit so this is a candle you’ll want to showcase as it’s burning. Just keep in mind it gave a medium scent throw so I would stick to medium or smaller rooms. Aromatique candles can be found in various high end department stores as well as their online store which is where I usually do my shopping. But, if you see these candles when you’re out and about, definitely check them out.